ABSTRACT: Diverse and moderately well-preserved palynofloras occur in Middle Jurassic sediments of the Kashafrud Formation at the Senjedak section, southeast of Mashhad, northeastern Iran. Trilete and monolete spores and pollen dominate the assemblages, whereas dinoflagellate cysts, foraminiferal test linings, and fungal spores are minor components. Forty-seven species of spores (30 genera) and 15 species of pollen (eight genera) are identified. Representatives of Dictyophyllidites and Klukisporites are particularly abundant. Based on the stratigraphic distribution of miospores, three distinctive stratigraphically successive palynofloras informally termed in ascending order, Assemblages A, B, and C are identified within the Kashafrud Formation. These are compared with palynozones known from Iran and elsewhere. Based on the presence of certain miospore species, the Kashafrud palynofloras are collectively dated as Middle Jurassic (Bajocian-Bathonian), thus corroborating the faunal (ammonoid) evidence. The appearance of a key miospore species, Contignisporites burgeri, within the succession has been used to attribute a late Bajocian age and early Bathonian age to the lower and upper parts of the studied interval, respectively. Inferred natural relationships of the miospores imply derivation from a diverse parental flora of Pterophyta and gymnosperms, such as Coniferophyta, Cycadophyta, and Ginkgophyta, growing under warm, humid conditions during the Bajocian-Bathonian. 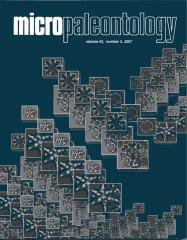 The associated marine fauna (ammonites), marine palynomorphs (proximate dinoflagellate cysts, and acritarchs such as Micrhystridium), and foraminiferal test linings, along with terrestrial palynomorphs (spores and pollen) collectively indicate an open marine, nearshore depositional setting for the Kashafrud Formation at the section studied.